When you think about affordable small weddings, images of city hall or Las Vegas, usually come to mind. Now, there's a better venue in Richmond, Virginia called Tiny Chapel Weddings. It’s a small non-denominational church on wheels created for small intimate ceremonies. 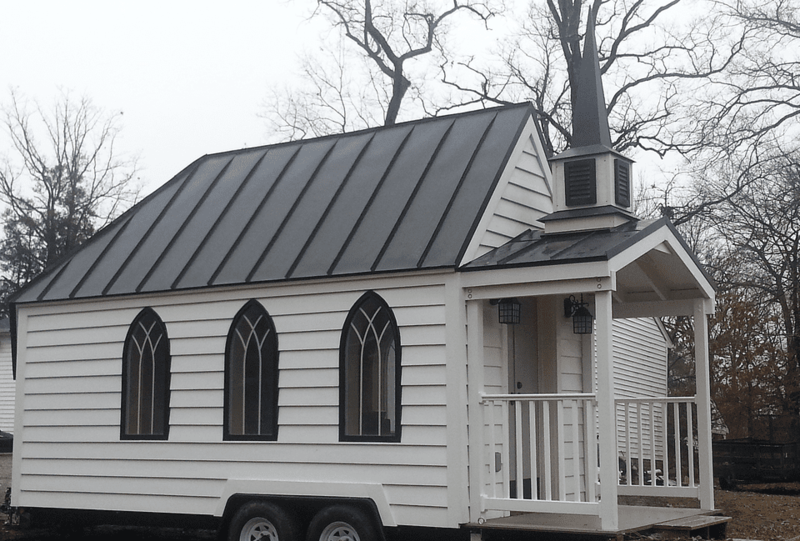 Bill Malbon, an ordained minister who owns the tiny chapel on wheels, wanted to build a larger house of worship that would accommodate 200 people, but the recession squashed his plans. Things got back on track when he learned about the tiny house movement. That's when he decided to downsize his original dream. After doing some research, Malbon hired Build Tiny, a local business that specializes in constructing microstructures. A short time later, Tiny Chapel Weddings came into being. Malbon’s tiny chapel can accommodate around 20 standing people and has two single pews for guests who need to stay off their feet. It’s equipped with lighting, heating and a small prep area for the bride. Tiny Chapel Weddings is currently accepting bookings for the upcoming wedding season. A basic wedding package starts at $100 for a 30-minute ceremony at the chapel's home base. A premium wedding package where the chapel comes to you (within one hour of Richmond, Virginia) costs $400 to $500. Currently, they are not offering their services out of state, but many hope they will launch a tiny chapel wedding franchise.